The sutrode combines the electrical properties of an electrode with the mechanical properties of a suture. A new electrical simulation device is being pioneered by researchers from the ARC Centre of Excellence for Electromaterials Science (ACES). The new device could possibly replace the use of pharmaceuticals in treating a range of medical conditions. As reported, the team has developed novel graphene fibres that have the ability to both record electrical impulses and electrically stimulate nerves with unprecedented levels of control. The fibres were developed in collaboration with researchers from the University of Texas in Dallas. Although the treatment of a multitude of conditions was revolutionised by the development of pharmaceutical drugs, there are a number of limitations in terms of side effects and focused delivery. The emerging field of electroceuticals, however, allows for the localised targeting of electrical stimulation to the neural circuits of specific tissues and organs to develop, to improve and to regenerate performance. 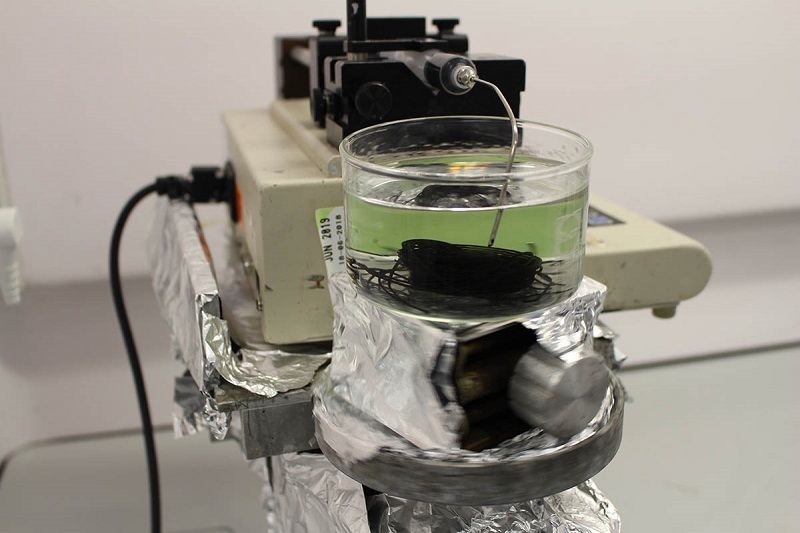 Currently, the field of electroceuticals uses existing materials to create the implantable electrodes. These have demonstrated compatibility issues with soft tissue, which limits the effectiveness of the electrical communication with the nerve. The team has used the traditional wet spinning fabrication method to manufacture a new style of fibre based on graphene to develop the ‘sutrode’ in order to combat this challenge. These sutrodes have demonstrated significantly improved electrochemical activity within nerves, and are stiff enough to penetrate soft nerve tissue. However, they are flexible to accommodate for micro-movements once implanted. ACES Director Professor Gordon Wallace said the team has long held a vision that the extraordinary properties of graphene could be used to enable better communication within nerves, which the sutrode has shown to be possible. Greater spatial control is the key in successful electroceuticals to effectively stimulate specific nerves to treat specific medical conditions. The sutrode has demonstrated unprecedented sensitivity in recording signals from nerves and unprecedented spatial resolution over the electrical stimulation of nerves. These could be an ideal material for developing the next generation of neural stimulation and recording electrodes that provide the opportunity to treat a range of diseases without drugs, such as diabetes. Its strength and flexibility allow the device to be tied around incredibly small nerve bundles that then record and detect neuronal activity. This gives a more effective communication from these individual nerve areas than any current electroceutical methods to then determine specific treatments for specific conditions. TRICEP, Australia’s newest 3D bioprinting facility in North Wollongong, will be producing the sutrodes. The facility is a 100% owned initiative of the University of Wollongong (UOW) and works with research institutions to develop innovative technologies using 3D bioprinting and biomaterials. The Professor highlighted that breakthroughs like this are directly linked to the emergence of the multidisciplinary area of 3D bioprinting. He furthered that we are in the midst of a revolution in science and technology, where the idea of a 3D printed body part is now becoming a very real possibility. ACES and UOW are making it possible for anyone to learn about 3D bioprinting through a Massive Open Online Course (MOOC) Bioprinting: 3D Printing Body Parts. The ARC Centre of Excellence for Electromaterials Science continues to advance cutting edge electromaterials science through the discovery of new materials, technology breakthroughs and 3D fabrication machinery to enhance the performance of electrochemical devices for applications in energy, robotics, medical bionics and diagnostics.